Kathleen Ann (Kit) Kennedy, was a member of the Cadet Nurse Corps at Mount Auburn Hospital, Cambridge, MA. She had graduated from Medford High School, (Medford, MA) in June of 1944. During that summer she was at home caring for her ailing mother when she heard a broadcast on the radio in which the nation's first lady, Eleanor Roosevelt sought volunteers to join the Cadet Nurse Corps, an organization established to encourage young girls to enter the nursing profession to take the place of those who were serving in the armed forces during World War II. At that time, hospitals across the United States were coping with a severe shortage of trained nurses due to the war. Many nurses had joined the services and were deployed to hospitals all over the world. The Cadet Nurse Corps was administered by the United States Public Health Service from 1943 through 1948 and was intended to replenish the supply of nurses on the home front by offering training at no expense to the trainees in return for a commitment to serve in essential nursing after graduation for the duration of the war. After hearing that broadcast by Mrs Roosevelt, Kit Kennedy signed up for the program and entered training at Mount Auburn Hospital, Cambridge, MA in September, 1944. Initially, the trainees were paid a stipend of $10 per month. "It was just about enough for carfare to the hospital each day," she said. The stipend increased to as much as $30 per month as the trainees progressed through the program. Kit Kennedy completed her training in 1947, two years after the end of World War II. Because the war had ended, she was not required to enter the armed forces and instead went to work at Boston City Hospital in the Pediatrics Ward. She married Joseph G. Flynn, a Navy veteran of World War II and a Boston Firefighter, in 1950. They moved to Lexington, MA and raised five children. They were married for 55 years prior to his death in 2005. 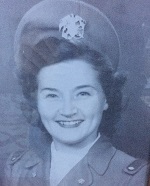 Kit left nursing for a time while raising her children, but returned to the profession in the 1960's working as an emergency room nurse at Sancta Maria Hospital in Cambridge, Massachusetts, for many years before joining the Raytheon Corporation as an Occupational Health nurse at their corporate headquarters in Burlington, Massachusetts. Now 90 years old, she is retired and resides in the Boston area.